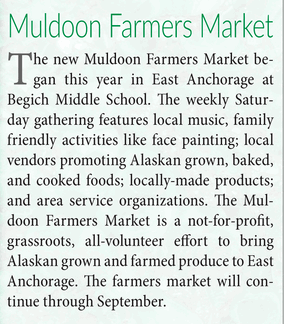 Muldoon Farmers Market features Alaska-grown or caught fresh farm produce and seafood, locally baked or cooked food, high quality crafts from local artisans and live music. Open 9:30 a.m.-2:30 p.m. every Saturday, June 24 – September 23, 2017, at Begich Middle School, 7440 Creekside Center Drive. This entry was posted in event and tagged 2017, july. Bookmark the permalink.